So, I picked this song because I dressed like Tinkerbell for this race complete with a set of wings. 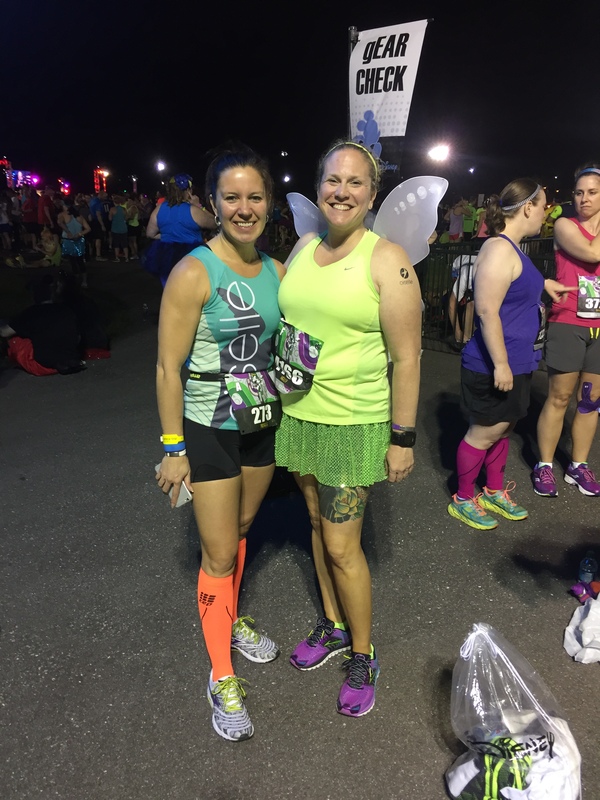 It was a PR for racing in fairy wings! If you ever need any fairy wings, I recommend Sparkle Athletic’s Racing Wings and of course, you know, I am a big fan of their sparkle skits and own a rainbow of colors! The wings did not annoy me, at all. I planned to meet up with my Oiselle teammates for a team picture and little hanging out before we headed to our corrals for the race. From the minute we left our condo to drive to Epcot where I would take a shuttle bus to the ESPN Wide World of Sports for the start while Mike and the kids played at Epcot until I finished, I could tell there was not the usual Disney level of organization. It took us 30 minutes to get into the parking lot (we were only staying 5 minutes away) at Epcot. The signs were super-confusing, telling us at one point we had to merge left only to make us merge right, again. The people directing traffic were not directing, waving their red flashlights all around and not in any one direction. What was up Disney? Y’all are supposed to be uber-organized. We finally made it to the parking lot and I sprinted over to where the shuttle buses were, only to stand in a really, really, really long line of runners also waiting for shuttle buses (really, really, really long lines were the theme of this Disney trip). Then, it took the bus 30 minutes to get to ESPN WWS. The hold-up? Traffic jams full of other shuttle buses. Everyone on the bus was questioning why this was all taking so long. Disney just was not on its game last Saturday night. I finally found my Oiselle teammates and we hung out for a bit. A wind picked up and there was a strike of lightening. Suddenly, an announcement was made saying we all had to be evacuated into the WWS complex. We shuffled in a pack into the buildings and sat on the floor, elbow-to-elbow.They said they would delay the race. Finding my teammates and hanging out with Joyce and Becca was the silver lining. If I had to wait alone, I would have been even more bored. All of the cellular data networks were jammed by so many people in such a small space trying to text, Tweet and FB post that I could not communicate with Mike and Carly back at Epcot. 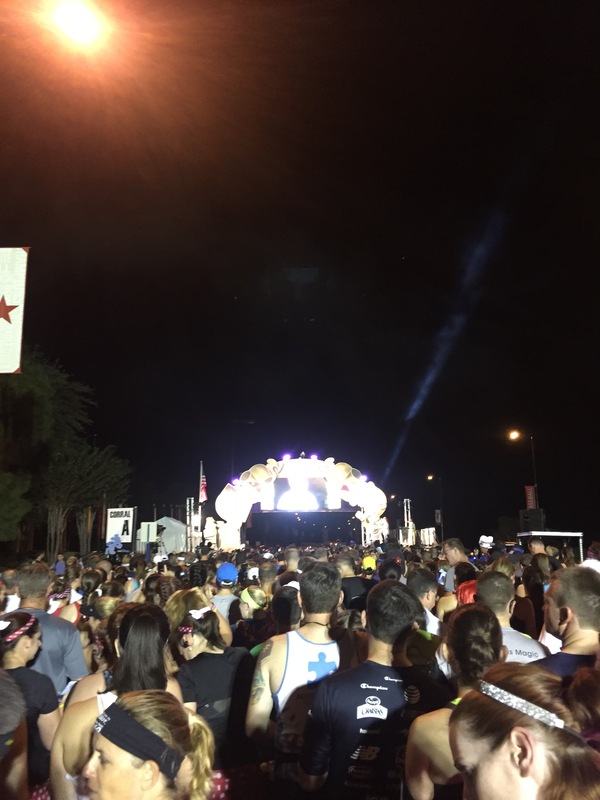 With no official announcement from RunDisney, other people started getting up and making their way to the corrals so we did, too. Once we got to the corral area there was another announcement that they had no idea when the race would start so we sat down. Eventually, some people near the front must have gotten word that those of us in the back did not and they started moving towards the corrals so we did, too. Once in the corrals, an announcement was made that the course had been modified. That was the only information we received. We had no idea what “modified” meant. Was it shorter? Were we going on a different route? Hello? Runners are typically Type A people and lack of information makes us upset. Finally, someone next to us found a volunteer who said the course had been shortened. Hmmm. People were terribly disappointed. Some people had on shirts that said it was their first half marathon. 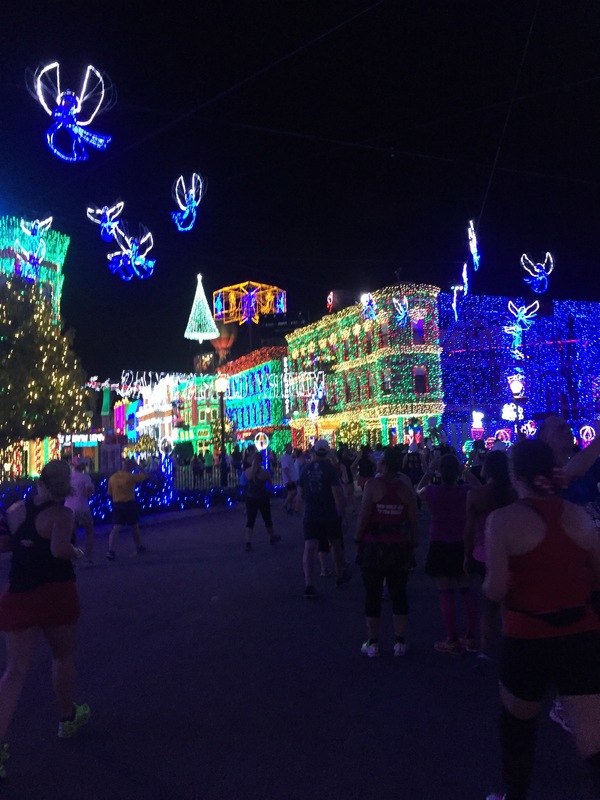 All of us had spent a significant amount of money to get to Disney to run this race. We found another volunteer who told us we were running “somewhere around 6 miles” and that we would completely by-pass the Animal Kingdom. I just wish Disney would have made an official announcement instead of allowing us to rely on rumor. No such luck. We started but I lost Becca and Joyce in the crowd because it was crazy crowded and it never thinned out for the whole 6-7 miles of the race. Normally, half marathons thin out after the first few miles and you can make your own space. There were only a handful of character stops and I didn’t feel like any were worth stopping to stand in line. Also, I knew Mike and Carly had no idea what was going on and might worry so I just kept going. Running through the Osbourne Family Lights was fun. The rest just felt like running past a lot of dumpsters and metal buildings. It was nice of the volunteers and the cast members to be in the dull spots to cheer us on. I finished and found my family. They missed me at the finish because the runner tracking was all jacked up due to the shortened course. My watch said I ran 6.8 miles but they guy who finished next to me had 7.1 miles on his watch so who knows. To my knowledge, RunDisney has yet to clarify or provide any information. I crossed the 10K mat before I crossed the 3 mile mat. Apparently, Disney made no announcement at Epcot to let the people waiting on runners (the park was closed to everyone else at that point) know that the race had been delayed and shortened. The kids had ridden Test Track and Soaring a bunch of times but Colin was pretty much asleep by the time I got there. My plan had been to head to the countries to partake of food and drink from the Food and Wine Festival before heading home. The problem with this was that with the shortened course, so many people finished all at the same time that there was no trickle of finishers like there would be in a longer race. There was no way to cross the course to get to the food and wine festival so all the finishers were trapped in the front with no way to get back. There was absolutely NO food in the front of the park. They gave out boxes of food at the finish but the chute was so crowded I missed my box, figuring it was not that big of a deal because I could get food at the festival. Not so much. We ended up just leaving and I ate chips and salsa back at the condo before going to bed. All in all, I am pretty disappointed with Disney, in general. A lot of the magic has worn off. I’ve been to Disney at least a dozen times and this was the worst visit. I think the new Fast Passes in advance have sucked a lot of the fun out of the parks. I think there are too many people in too little space. I think Disney has not been able to keep up with the demand in an effective manner and the cast members seemed overwhelmed and some were downright rude, a first for me at Disney. The race was really unorganized and the lack of communication was very frustrating. I get the safety issue but if the Marines can convince 7 different law enforcement agencies and three cities to keep a marathon course open 30 minutes later because some metal detectors went down in the rain, delaying runners, I feel like Disney, on Disney property with Disney employees could have found a way to make the full race work despite the weather delay. Even if they felt like they could not, they could have at least communicated this and told us how far we were going to run. I got my Coast to Coast medal (one of the main reasons I did this race) but I don’t feel like I really earned it. 13 year olds don’t take great pictures at 1:30 AM. The Disney Princess in 2014 was so much more fun than this race. The Star Wars Rebel Challenge in Disneyland in January was amazing. I am done with the Wine and Dine. I am done with Disney races for awhile. I am also done with Disney World. I can think of a lot more places to spend my money and I have a lot more places I want to see while running. So, this racing season has come to an end. 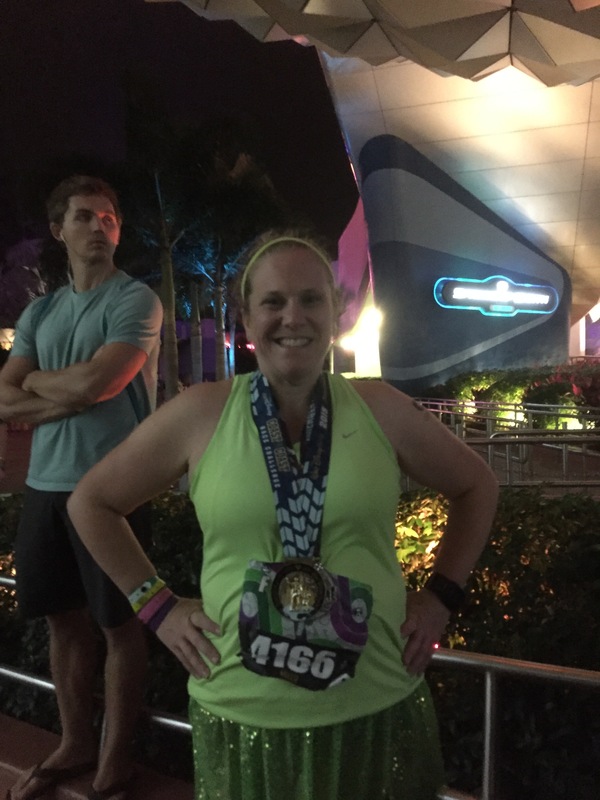 It started with the Marine Corps 17.75K and ended with the Disney Wine and Dine Quarter Marathon. I still have two small races coming up but they are only 4 and 5 miles and I’m not racing them, just having fun. I have put a lot of miles on these legs since March and finished a second marathon so I’ll consider it a success but there is always room for improvement. I’ll keep running for fun in the off-season and my next training season starts at the end of January.